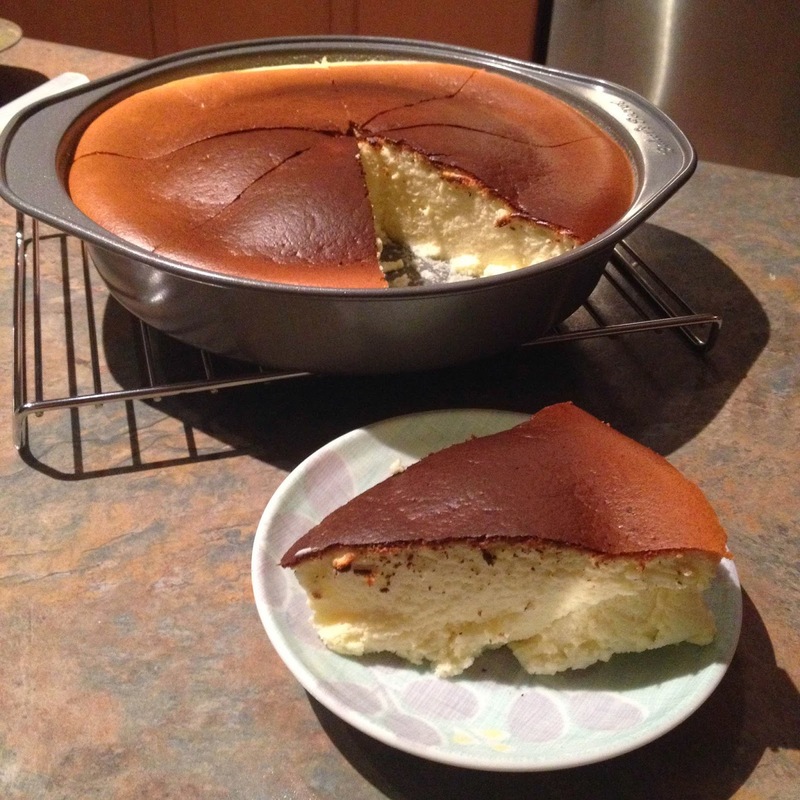 Let me introduce to you the Japanese-style cheesecake. Light. Fluffy. Heavenly. It's not as rich or dense as New York-style cheesecakes. My family loves this dessert and they always request to have this made at home. Several of you have asked for this recipe so now I'm sharing it with you! 1. Mix the ingredients in group A together in a bowl. 2. Mix the ingredients in group B together in a separate but larger bowl. An electric mixer will work best. 3. Slowly add group A mixture into the group B bowl and continue mixing using an electric mixer. 4. In another separate bowl, beat group C ingredients together using a whisk. DO NOT get any kind of water or liquids in contact with it. Beat until the egg white stands up (you can tell it's ready if you're able to flip the bowl upside down and the egg white doesn't spill). 5. Slowly and gently fold group C mixture into the Group A+B mixture. 6. Preheat oven to 350° F.
7. Pour the complete mixture into a greased cake pan (I use an 8 inch circular cake pan). Place the cake pan onto a flat baking pan that is filled with water so that the bottom of the cake pan is submerged. 8. Bake for 40 minutes. All done! Enjoy your delicious cheesecake! I would love to see how yours turn out. Tweet me a picture or Instagram it and tag me. My username for both is @desireelaw. If you need any clarification you can comment below! Looks amazing and tastes amazing! Thank you for sharing with us this recipe, I cant wait to try this recipe out :) It looks so yummy and delicious!!!! !